Now that we’ve got a bit of history, let’s move on to the actual build. Even though it looks radically different from a conventional steel string flat top it wouldn’t be foreign to a builder of the latter. It has an X brace and size that closely resembles a Martin 000. The difference lies in the extra X morticed into the lower half of the bass side to reinforce the top for the 6 harp strings. The bridge plate is also larger to accommodate the extras strings as well. This is not to say that it is an easy build. 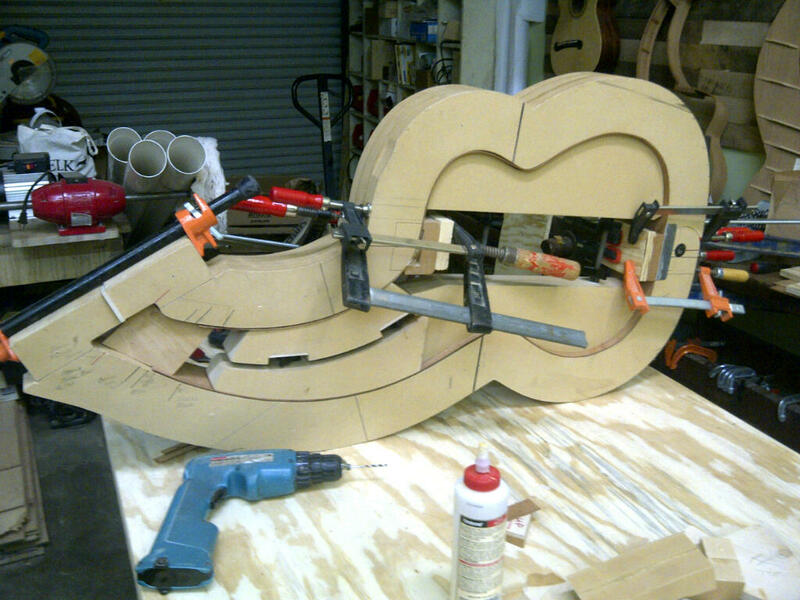 The hollow arm is essentially a hybrid of neck and body, having a head stock and a sound hole. The back is pretty similar to a normal steel string as well. 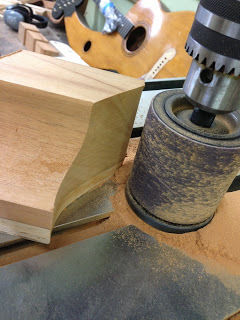 The head block for the harp head is also a complicated affair that requires some well thought out jigs to reproduce with consistency. Everything in the build is bigger, including the forms for the body mold. A radius form is used for the bracing and grinding the sides to the correct curve. Instead of a 2 ft. round form a 4 ft. is needed. All this can add greatly to the expense of gearing up. I have to say I get a kick out of people asking why hand built guitars cost so much! 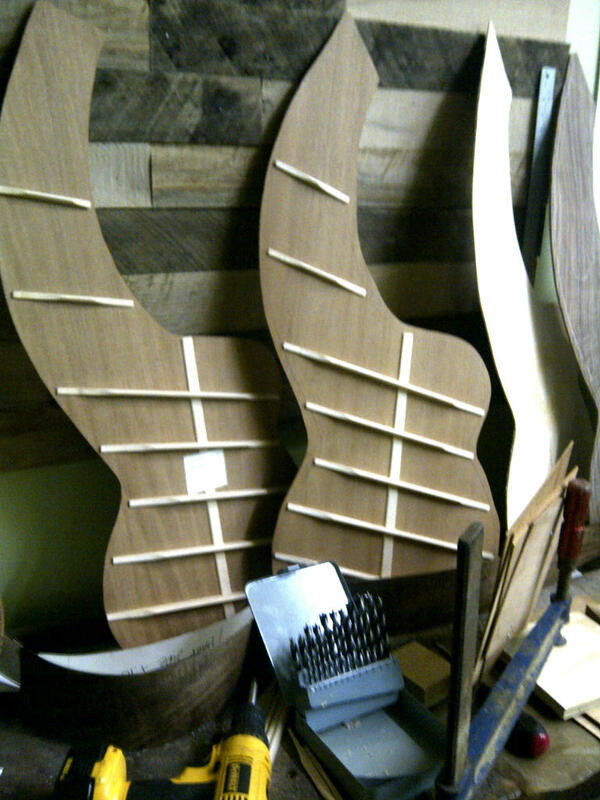 The sides are bent using heating blankets (bigger as well) on specially made molds to accommodate the multiple bends. 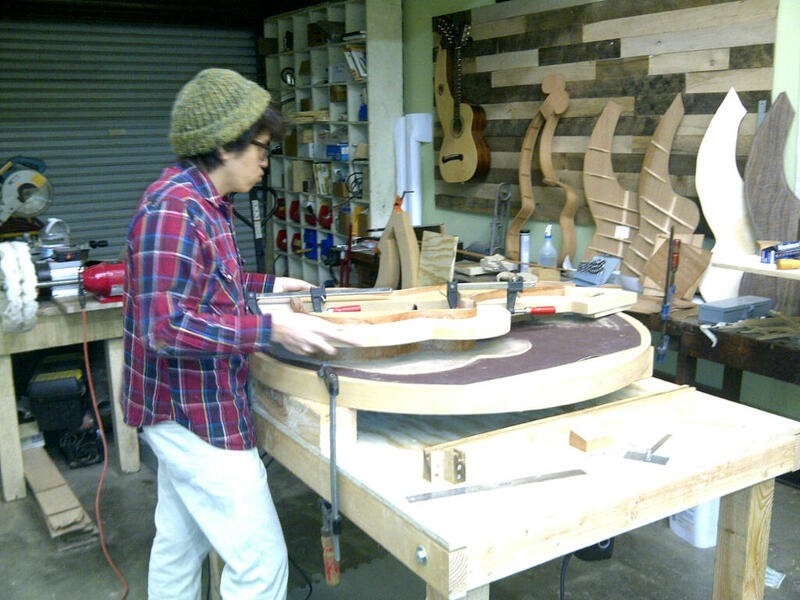 Next week, sound hole quirks and getting the back and top on. 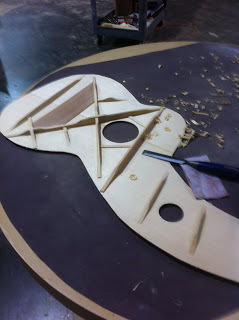 This entry was posted in guitar building, Guitar Stuff, Lutherie, Tools and tagged acoustic guitar, guitar building, Harp Guitar, Inlay, luherie school, Lutherie by Geiger School of Lutherie. Bookmark the permalink.